The power of focus is the one thing above all else that will help you achieve your goals. That and perseverance. Simplistically, the focused light of a laser is created when light waves are in sync with each other. The parallel waves are coherent and in phase. The light waves from a laser are the result of synchronicity and coherence resulting in focus. That’s what focus does for your work. Focus sets the waves of thought in sync so that light to your projects can flow coherently from your mind to the developing “life” of your creation. If you’ve ever shined a flashlight on the wall, you know that there are shadows amidst the light patterns. Often a dark circle around the central light, followed by another, more scattered area of light. Flashlights do not function coherently. Their waves interfere with each other and cancel each other out, similar to the effect of distractions. To Focus, is to create from a lighted mind. That’s what happens to your mind… and your work when you try to multitask and allow distractions to interfere. The light waves—consciousness—is more like the flashlight than a laser. Your attention is diffused, dimmed, and less effective and the waves of consciousness are definitely not in sync. Not only is the fractured light of mind less capable, it is also takes more energy because of the effort to focus in spite of a multitude of micro interruptions. It also take more energy to constantly shift between tasks and try to reorient at each one. 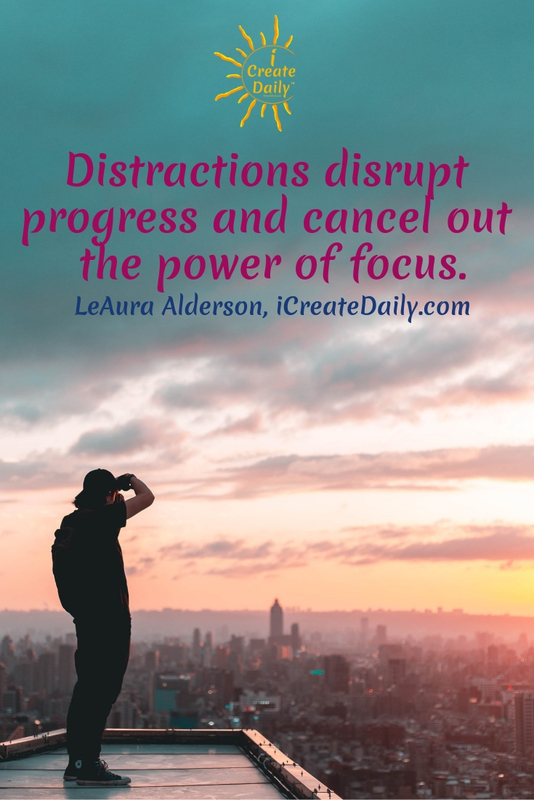 Distractions disrupt progress and cancel out the power of focus. So what can you do to strengthen your ability to focus? There are simple resources to help you train your brain to focus by synchronizing your brainwaves. Anyone of these will help your brain’s capacity for focus. Choose to engage one or more over time and enjoy the benefits. Brain training is a lot like training your body at the gym. It will respond to effort applied over time. Each of these activities help to synchronize your brain waves and help increase your focus by decreasing the mental noise and clutter. Multitasking diminishes mental clarity and produces chaotic brain waves. Multitasking minimizes mental clarity and amplifies mind noise. Meditation maximizes mental clarity and minimizes mind noise. Meditation helps to synchronize brain waves. So does periods of uninterrupted focus. In other words, the more you practice focusing, the more you’re training your brainwaves to align. Do not underestimate the power of distractions to disrupt progress. Conversely, do not underestimate the power of uninterrupted focus to achieve your best work. For a popular meditation resource, you may want to check out HeadSpace or Muse, or try our free meditation. Do not underestimate the power of uninterrupted focus to achieve your best work. Through the practice of meditation, your brain gets increasingly habituated to settling into a coherent state. You can totally purposefully cultivate that flow in whatever endeavor you’d like. Focus takes practice but it gets easier over time. More than that, you will come to seek it out. Focus is a positive addiction that requires no outside stimuli. When you arrive at that place you will know. It’s called “The Zone”, or, as one of our favorite authors, Sir Ken Robinson dubbed it: “The Element”. 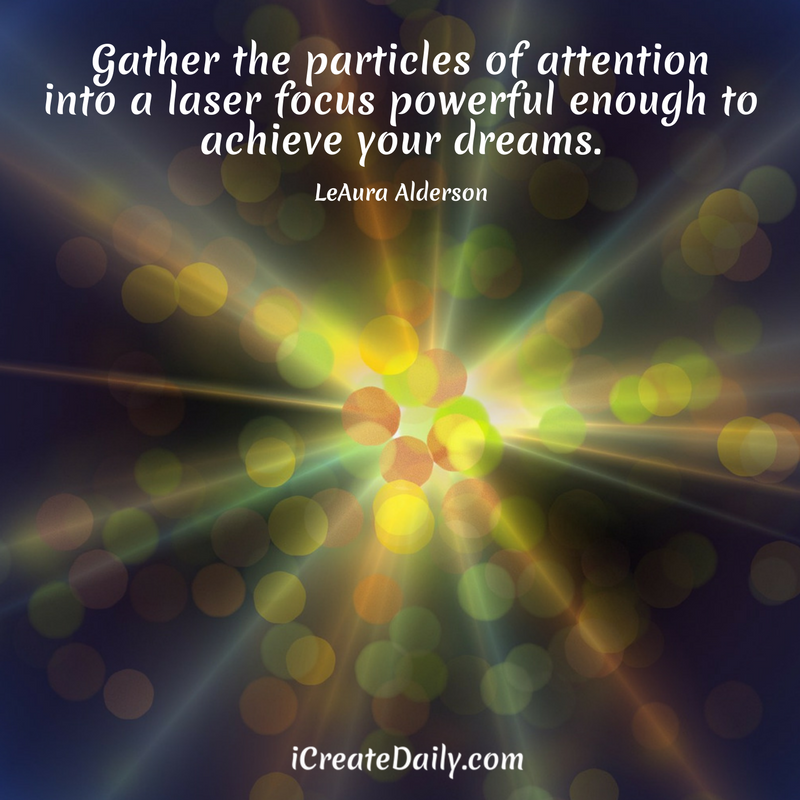 Gather the particles of attention into a laser focus powerful enough to achieve your dreams. Brainwaves and attention impact everything we think and do, including our relationships with others and with ourselves. This interesting Ted talk by Uri Hasson reveals some fascinating and relevant information on brain waves and communication. We think you will enjoy it as well, especially if you do any kind of writing, speaking or singing.